Please join us to celebrate the opening of Cheryl E. Leonard’s exhibit in our window gallery! The evening will include a brief performance by Leonard, and an interview hosted by instrument builder and window gallery curator Bart Hopkin. When I first began investigating the musical potential of natural objects I simply duct-taped microphones to rocks, shells, bones, wood, pinecones, and leaves, and attempted to rub, tap, bow, brush, and tickle new sounds out of them. I soon realized these materials would be more sonorous and much easier to play if I mounted them somehow. So, using hand and power tools leftover from my days working as a satellite dish installer, I started constructing crude stands out of pieces of driftwood that were lying around my studio. Over time my practical instrument stands have evolved into increasingly elaborate musical sculptures, and I now consider the visual aspects of an instrument to be of equal importance with its sonic qualities. One of the allures of creating music with natural materials is delving into the minutia of the very quiet, and most of my instruments are intended to be amplified. Microphones enable me to explore the subtle details of sounds produced by stones, driftwood, pinecones, penguin bones, icebergs, etc. I am fascinated and continually surprised by the voices these objects contain and the beautiful intricacies of their tones. Once I find a lexicon of sounds that intrigue me I shape them into musical forms that reflect, model, or demonstrate each piece’s theme. Most of my works are inspired by natural phenomena, structures, motions, or processes. Morphing ecosystems, water flow patterns, animal breathing rhythms, cloud formations, and the sculpting of mountains by glaciers are a few of the subjects my past projects have investigated. A passion for wild and remote places drives my creative process. I try to imbue my works with the sense of wonder and awe I have when I encounter millions of baby frogs hopping through an old growth forest, stand on a mountain summit looking at a rainbow halo around my shadow, watch a giant iceberg upend, or feel the booms of a calving glacier resonate in my chest. In making music with natural objects I hope to inspire others to hear the world in new ways, to look at common materials as potential treasures, and to consider the human relationship within the natural world. 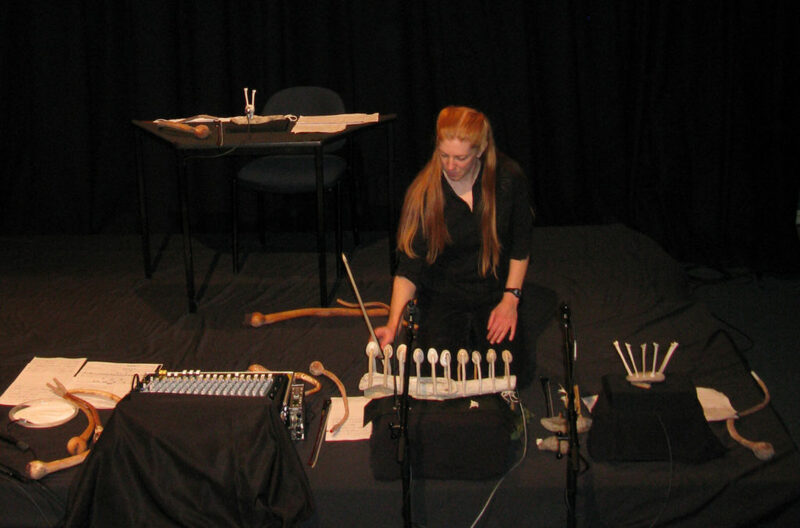 Cheryl E. Leonard is a San Francisco-based composer, performer, and instrument builder. Over the last decade she has focused on investigating sounds, structures, and objects from the natural world. Many of her recent works cultivate stones, wood, water, ice, sand, shells, feathers, and bones as musical instruments. Leonard is fascinated by the subtle textures and intricacies of sounds, especially very quiet phenomena. She uses microphones to explore micro-aural worlds hidden within her sound sources and develops compositions that highlight the unique voices they contain. Her projects often feature one-of-a-kind sculptural instruments that are played live onstage and field recordings from remote locales. Leonard holds a BA from Hampshire College and an MA from Mills College. Her music has been performed worldwide and her work with natural-object instruments has been featured on several television programs and in the video documentary Noisy People. Her collaborative works with visual artists Genevieve Swifte and Oona Stern have been exhibited in galleries in California, Norway, Australia, Mexico, and Argentina. Leonard has received grants from the National Science Foundation’s Antarctic Artists and Writers Program, ASCAP, American Composers Forum, American Music Center, the Eric Stokes Fund, and Meet the Composer. She has been commissioned to create musical instruments and compositions for Kronos Quartet, Illuminated Corridor, and Michael Straus. Cheryl has been awarded residencies at Oberpfälzer Kunstlerhaus, the Djerassi Resident Artists Program, the Arctic Circle, Villa Montalvo, and Engine 27. Recordings of her music are available from NEXMAP, Unusual Animals, Ubuibi, Pax, Evolving Door, Apraxia, 23 Five, The Lab, and Great Hoary Marmot Music.